One of the greatest secrets about the blues is that it’s not primarily about the “blue notes,” or the structure, or the instrumentation. Those things are all heavily associated with the blues and appear in most blues songs, but at its core, the blues is all about storytelling. And the guitar is one of the ways that blues singers tell their story. The tradition of blues guitar goes back as long as the tradition of the blues itself. In fact, when composer W.C. Handy first encountered the blues in the Mississippi Delta around 1903, he heard a musician playing the guitar using knives and singing repetitive lyrics. In the beginning, many of the blues traditions grew out of church music, gospel, and spirituals and mimicked the call-and-response dynamic that surrounded those types of music. The blues singer is like a preacher issuing his call, and if he doesn’t have a congregation to issue the response, the guitar is there to fill that void. 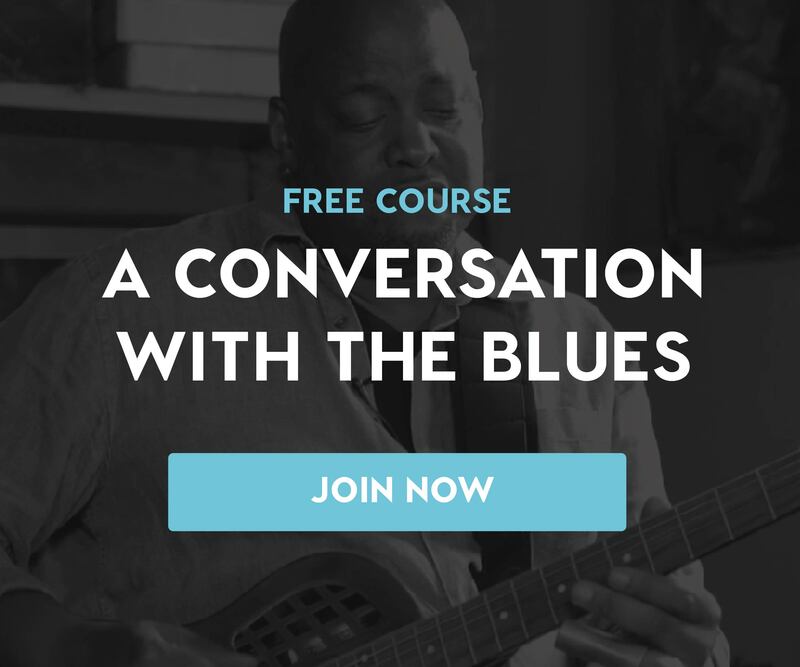 In this video from our free course “A Conversation with the Blues,” blues player Tomàs Doncker explains that while the blues is all about the lyrics, the guitar can serve as an extension of those lyrics — becoming, in essence, a second singer. Blues music doesn’t need a lot of notes or harmonic movement. Instead, it’s all about how best to tell a story, and how the guitar can help the singer do that. Listen to Doncker talk about how great blues singers like Muddy Waters and Howlin’ Wolf connected with their guitarists Buddy Miles and Hubert Sumlin, and used guitar lines to create a conversation in their music. Then sign up for “A Conversation with the Blues” to keep learning about the influence and power of the blues! Keep learning in our free course on the history, legacy, and forms of the blues, A Conversation with the Blues, taught by Princeton University Musical Director Vince DiMura.